If you are to read this new series which starts with this novel, be prepared to have a heightened sense of suspense! The sequel, Phoenix Rising: Firebase Freedom, having been released in December 2012, and the final segment of this series set to be published in 2013 will be reviewed also. Being familiar with the westerns written by these authors, I was intrigued when I ran across this novel recently. Now having read it, I cannot believe how awesome it is. Please be aware there is some foul language in the book because the main characters and scenes have to do with military personnel in precarious situations. I in no way excuse or condone the use of the language in the books. What I found when reading the story was how in some ways it mirrors what has and is happening in America today. Parts of the story have an end time feeling to them when the government elects its first foreign-born President of the United States. The president then begins to totally dismantle the structure of the government, military, finance and justice systems. He then sets up more than just a dictatorship. In fact what he does were it anything but fiction would be frightening. It would be a hard story to read if there weren’t threads of hope and freedom woven within the tale. One of the threads is the beginning of survival groups who learn to pool their resources together. The hardest part for these cells is learning to discern who is for America and who is for her utter destruction. Another thread that is introduced is the coming together of various generations from different wars, who need each other not just to survive but begin to formulate taking America back from the hands of those who are slowly destroying her piece by piece. These different groups of people from all walks of life begin to utilize each other’s strengths in order to lay a foundation to fight against evil. As I read this novel I had to continually remind myself this was a work of fiction, but also be open minded that as an American I need to always be diligent in safeguarding the blessings and freedoms we currently enjoy. 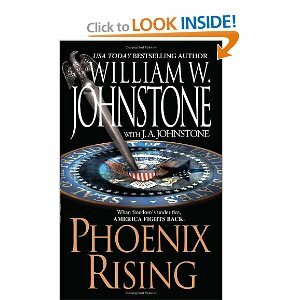 Phoenix Rising is full of action, suspense, and is a real page-turner that kept me reading until the end. Before reading this one I already had purchased the sequel, knowing that patriotism is one theme I enjoy reading about. Grab a copy of this novel and the sequel, and then strap yourself in for one wild and suspense-filled ride! I've got to get this one, I love a good suspense novel.